Transitioning to retirement is a more complex process than one would think, especially if one is a bit of a workaholic. The concept that EVERYTHING on my "To DO" list doesn’t have to be done within one month has been hard to accept. Updating my bibliographic supplement was high on my list, but accessing some of the new publications took more time than I expected. While waiting, I involved myself in such tedious but necessary projects as cleaning out and reorganizing my garage, figuring out what to do with all the things I brought home from my library office (no small challenge - had to purchase another bookcase) and waiting for the arrival of the 2009 Gaskell Journal, hoping to include all of its articles in this update. It literally arrived in today’s mail. As I said, AT LONG LAST! There are some twenty-five additions that are from 2009, almost half of which are book chapters Some of these monographs are based on PhD dissertations while others are original scholarship. I have already identified 8 more books due out later this year (most of which are not in this update) or in the first few months of 2010 (none of which I have included). Among the novels, Cranford, Mary Barton, North and South and Wives and Daughters continue to dominate the critical attention, though there ARE publications that explore aspects of Ruth and Sylvia’s Lovers. Gaskell Society member, Dudley Green’s impressive biography of Patrick Brontë challenges a range of issues with Life of Charlotte Brontë but, gentleman that he is, does so respectfully. Thomas Ricchio (also a member of the Society) has expanded upon his bibliographic study of school editions of Cranford to produce a comprehensive bibliographic history of this novel. Several shorter works (My Lady Ludlow, "The Crooked Branch", "The Old Nurse’s Story". "Lizzie Leigh" and "The Poor Clare" have received new attention. Topics explored have included dance, tourism, Gaskell’s autograph collection, various aspects of Gaskell’s life, newly discovered correspondence, naturalists in her works, servants, language, landscapes, death, and cruelty. Over my 40+ years as a librarian, I have noticed a pattern in literary criticism that we Gaskellians may see this coming year. There is a core of authors (the MAJOR "cannon" folk) who receive a consistent, high level of critical attention: Shakespeare, Milton, Hemingway and Faulkner immediately come to mind. Others get less steady attention, but when special events associated with their lives or works occur (anniversaries of birth, death, publication dates of major works, etc. ), there is a temporary, sometimes dramatic increase in publications. For example, in 1984 the critical attention given to Orwell’s novel 1984 increased dramatically. In most years from 1950-1980, this novel attracted 1-6 articles in the journals indexed in the MLA Bibliography. In 1981, 1982 and 1983 the number jumped to 9, 11 and 33, respectively. In 1984, there were 119! Since 1984, the number has dropped steadily with only 1 published to date in 2009. Next year, 2010, is the bicentennial of Gaskell’s birth, the type of anniversary that generates increases in publications. Additionally, TV dramatizations of Cranford starring the well-know AND well-reputed actress Dame Judi Dench have brought Gaskell’s works to the forefront of people’s awareness. It will be interesting to see if Gaskell matches Orwell’s 119! For those of you who did not have the opportunity to attend this past summer's Conference held at the University of Cambria in Penrith, it was excellent! The facilities more than met our needs. The papers were strong and challenging. 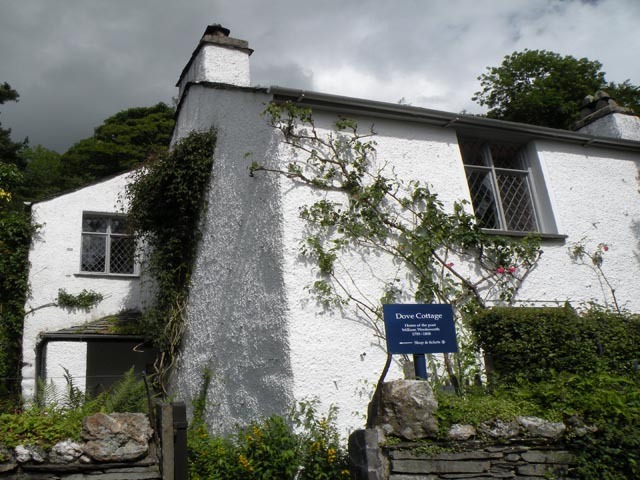 I returned with pages and pages of notes, wonderful photographs of the Lake District (including the beautifully gardened homes of Ruskin and Wordsworth) and members of the Society. We happened upon the annual rush bearing ceremony in Grasmere. I abandoned my usual practice of renting a car and re-honing my skills driving on the "wrong" side of the road and instead enjoyed the coach ride from Knutsford to Penrith (and back) with members of the Society. It gave me the opportunity to renew former acquaintances and meet exceptionally interesting new participants in this biennial event. By using this mode of transportation, I was able to participate in two special stops: one at Abbot Hall and one at Silverdale. Abbot Hall contains an exceptional art collection, including some WONDERFUL Ruskin paintings and George Romney’s The Gower Family. The art historian side of me was thrilled! What continues to please me about the Gaskell Conference is the comfortable blend of "major" Gaskell scholars and non-academic Gaskell enthusiasts, all of whom bring to these events a strong understanding of and great insights into Gaskell's writings. We learn from each other and we are exceptionally fortunate to have this balance. I DO hope to be able to return to my practice of updating my bibliographic supplement each January and July. If I have missed anything published in English within the time period covered (2002-2009), please e-mail me. I have begun writing the annotations with the goal of a timely publication of my third book, this one covering 2002-2011.